For several days this month, scientists are gathering in the largest gray seal pupping area in U.S. waters to study weaned gray seal pups, aided by images from an airplane and unmanned aircraft systems (UAS), commonly called drones. The researchers hope to gather data from two islands in Massachusetts and other breeding sites in Maine to move a step closer to answering a nagging question – how many gray seals are there in Northeastern waters? – and expand their studies on the health of the animals. 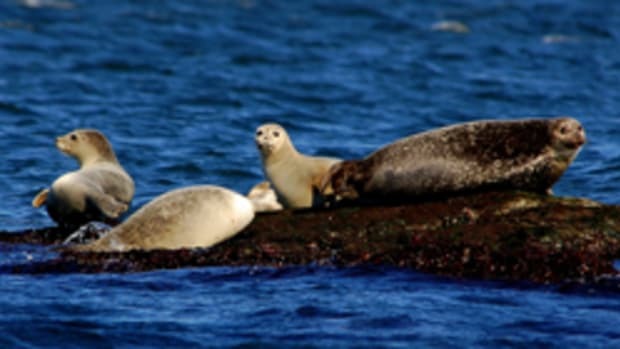 The researchers, from NOAA Fisheries and a variety of federal, state, academic and private organizations, are working on Muskeget Island off Nantucket, the largest gray seal breeding and pupping colony in the U.S., and on the Monomoy National Wildlife Refuge, an island near Chatham on Cape Cod. Similar work was conducted in January 2015, when marine mammal researchers captured, tagged, sampled, and released 126 weaned gray seal pups on the two islands. The aerial images will help document the number of pups on the breeding grounds as well as pup distribution. The images can also document adult seals, providing data on brand marks or entanglements. Biological samples collected from weaned pups will reveal information about stock health, gray seal ecology, and habitat use. Mid-December to early February are prime pupping months for gray seals. Gray seal pups that have been weaned remain on the islands for several weeks until they molt or shed their white coat, known as lanugo, for a darker fur coat or pelage.